I, for one, welcome our new snowmen overlords. As promised yesterday, this is the second part of Sunrise 118’s post. Yesterday morning, after checking out the sunrise, I ventured into the park to see what was new. As I approached the lawn I noticed something across the way, about 80 yards on the other side of the park. 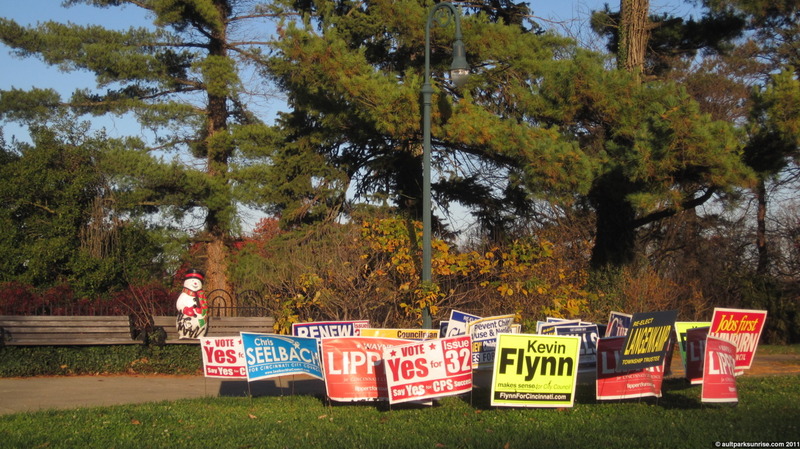 Someone had gathered up a bunch of political signs and planted them together in a group. 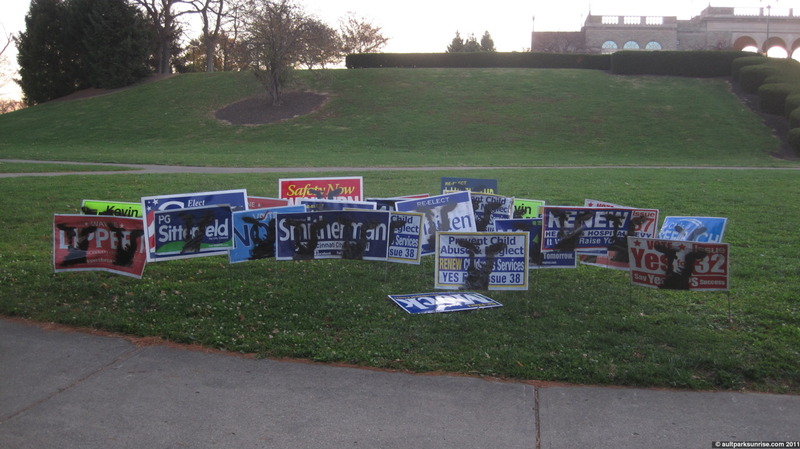 After all the local TV ads stop and the results are tallied, what ends up happening to all the political signs? Well, some of them ended up in Ault Park! 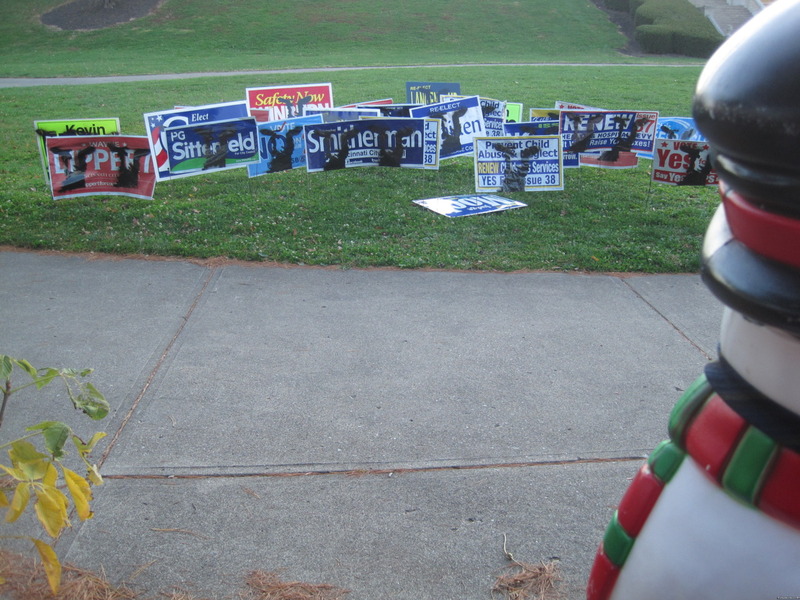 The political signs were all organized in a tight group and each was facing the snowman. 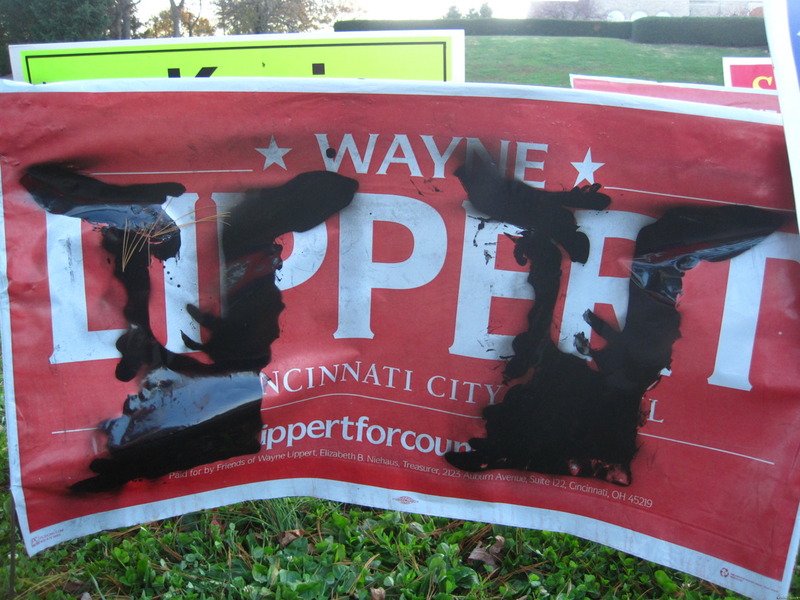 Each of the political signs, without exception, were marked with a capital “V” in black shoe polish. Some of the signs were “double long” and were marked with a double V. Upon further inspection, it appears that each of the “V”s are almost identical, implying they are drawn with a stencil. Maybe spray paint, then, not shoe polish. UPDATE it was pointed out by Togie and RossTheColonol that these are not, in fact, the letter V. They’re actually stencils of a SHEEP. The sheep is looking directly at you. It’s kind of hard to tell at first, but it becomes obvious. That makes it even more powerful! The snowman sat atop a bench. 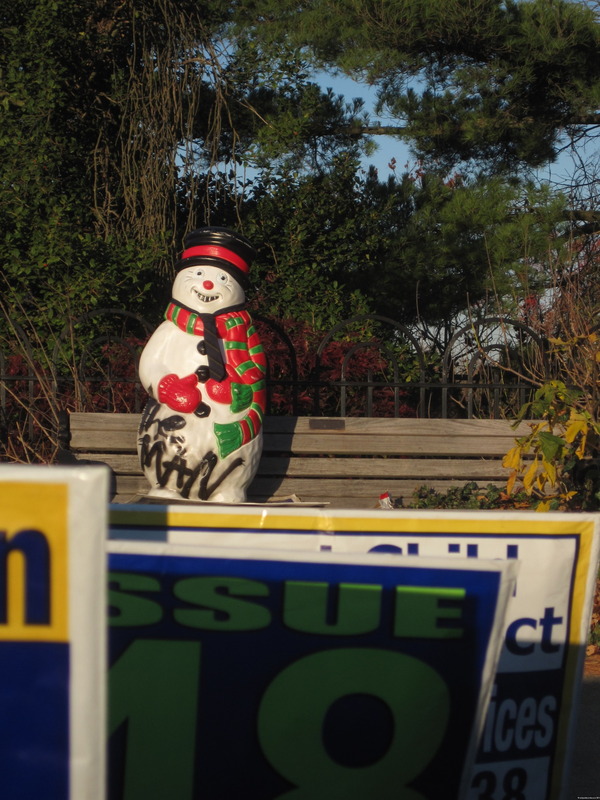 Care was taken so that the gravel that filled the snowman did not spill out onto the bench (a political sign kept the gravel from falling out of the bottom). There were no other signs of vandalism or damage. A respectful installation! 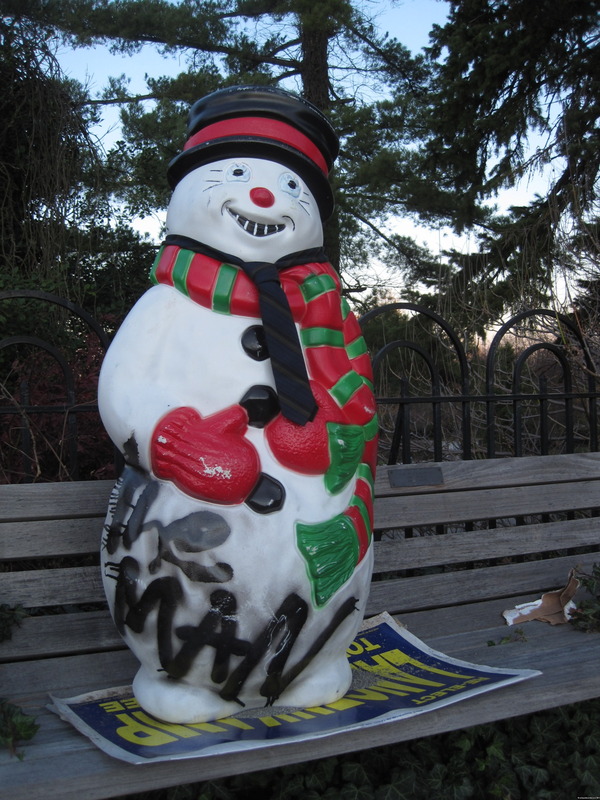 Across the side of the snowman, in big bold letters, was written “THE MAN”. The phrase was also written along the back of the snowman. 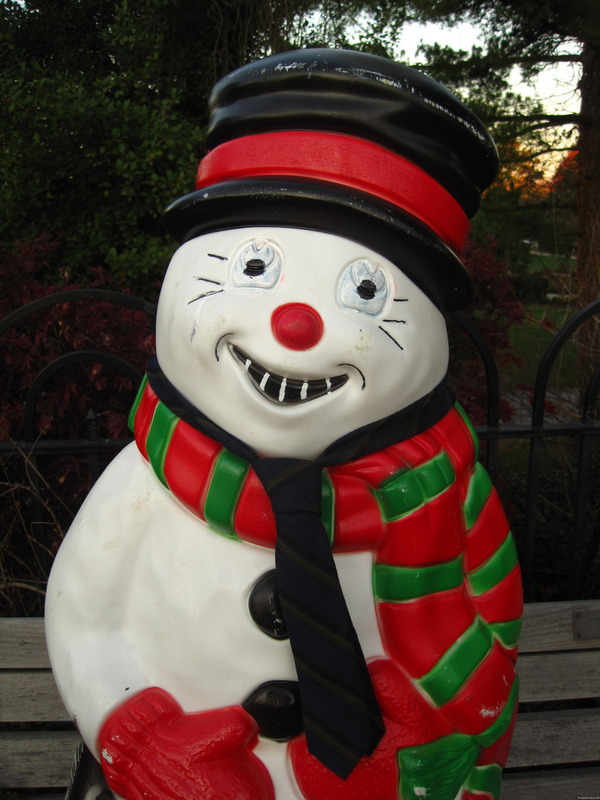 The snowman’s face was modified. His eyes were colored white and then small beady pupils were drawn in the center. His mouth had teeth drawn with white-out and cheek-bone lines drawn with marker. There were also wrinkles drawn around his eyes. The snowman had a nice little tie around his neck that I almost didn’t catch at first. I actually found it to be a very interesting piece. I have no idea who made it, or how much thought was put into it. 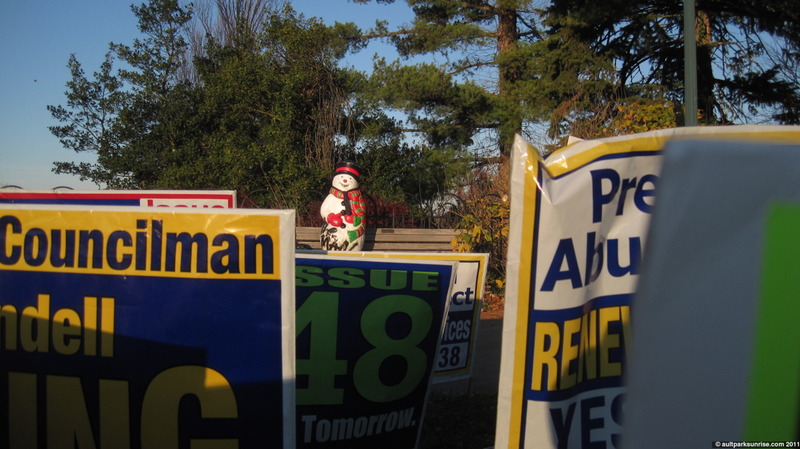 Given the detail of the snowman, the tight clustering of the political signs, and the writing on each of the signs, someone out there certainly wanted it to be seen. Personally, there are several parts about the piece that I really loved. I may be extracting meaning where the artist didn’t intend there to be meaning, but I’ve always thought that relative purposeful meaning can be derived outside of the intentions of the original artist depending on the context in which a viewer of an art piece experiences the piece. Anyway, here we go. This is what I like about it. 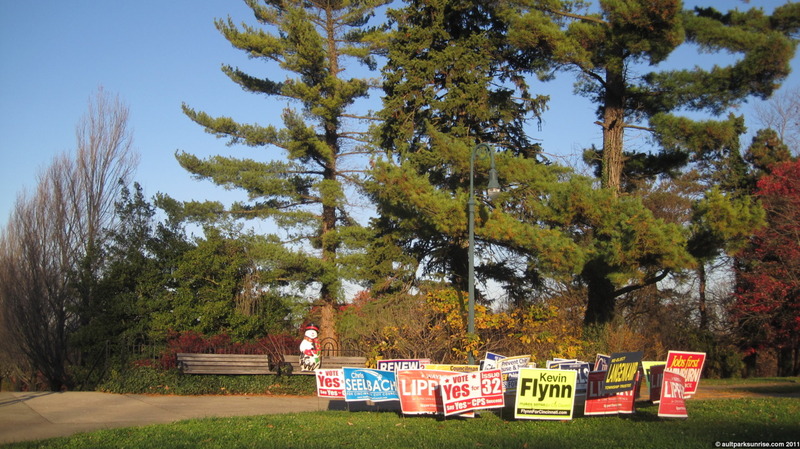 I love that each of the political signs come from all areas of the political spectrum. 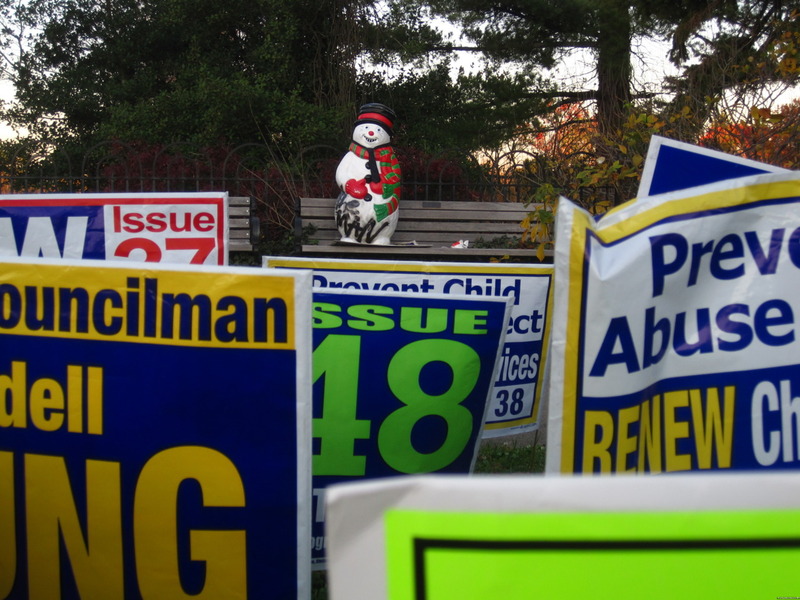 The way they are clustered together into an “audience” to the snowman’s political rally is interesting because even though each sign represents a different “choice”, each sign is equal in the audience to the Snowman. Now that I know that the stencils are “sheep”, not a “V” like an artist signature, the meaning is much more straight forward. I like that the snowman is a fantasy character. It adds a bit of surrealism to the entire operation. It also makes the idea of “The Man”, an otherwise intangible and scary character, into a tangible albeit fictional figure. 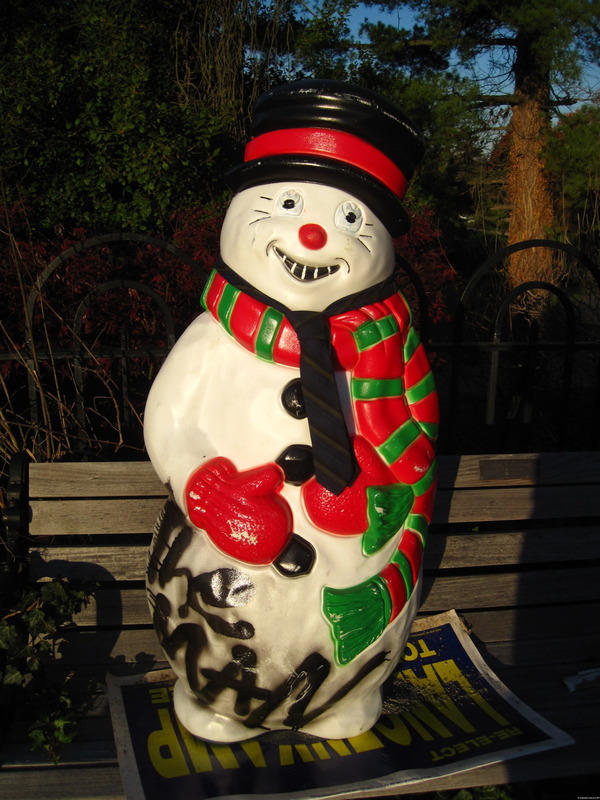 The details on the snowman really seal the deal. 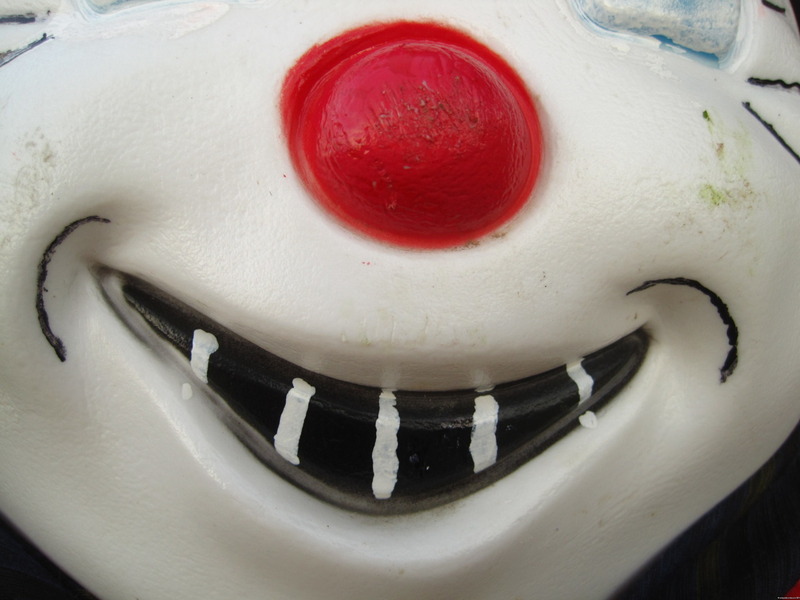 His face looks seedy with a plastic smile (hah! ), beady eyes, and the teeth. The tie is also a nice touch. That’s the one detail that makes me think this had some real planning behind it. I like that the political signs are real. They’re taken from the urban landscape and reused to make a statement. The obvious message that I take away from this is that choice is an illusion and the Snowman (“The Man”), lying behind the scenes, is benevolent in his power! 🙂 As Zach de la Rocha from Rage Against the Machine said, “There is no other pill to take so swallow the one that makes you ill!”. 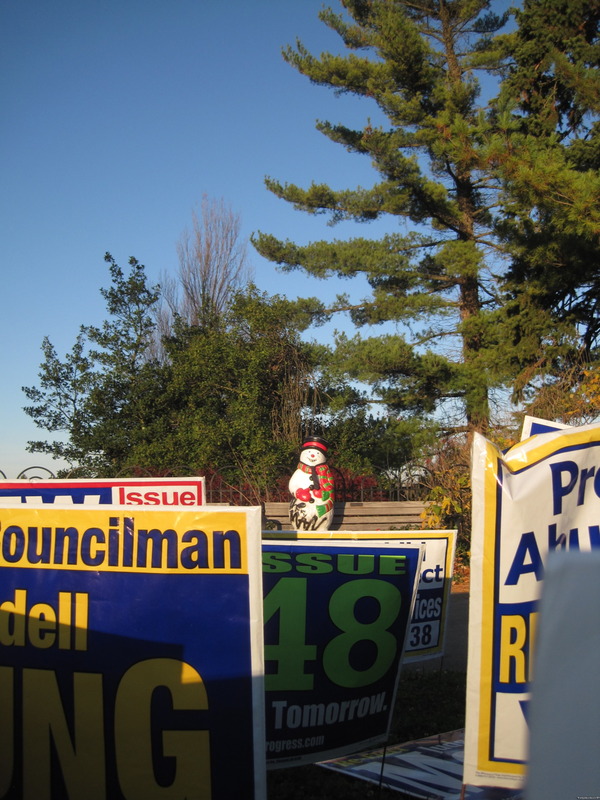 A full moon rises over Snowman’s political rally. The eager audience, each “marked” with a V or double V in black shoe polish stencils of a sheep. If you’re on the front page: for the rest of the pictures (about 19 total), please click to continue. 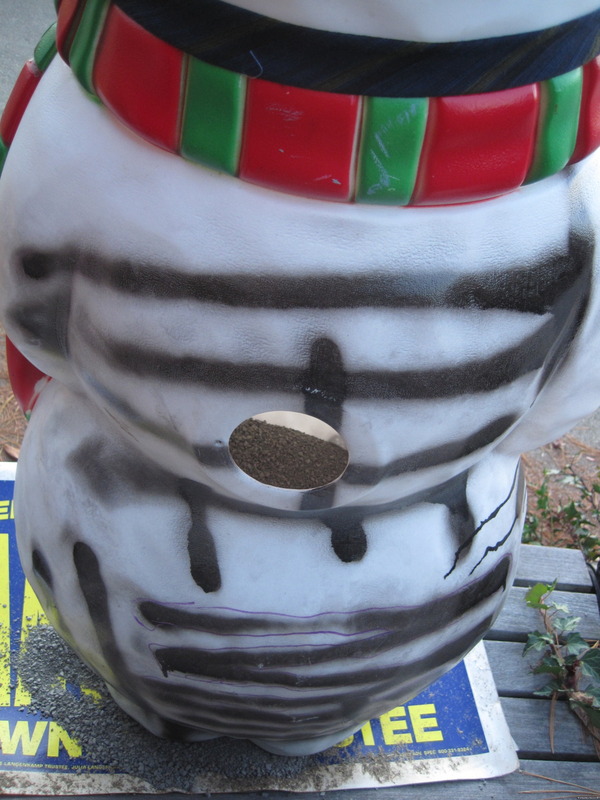 “The Man” marking on the rear of the snowman. 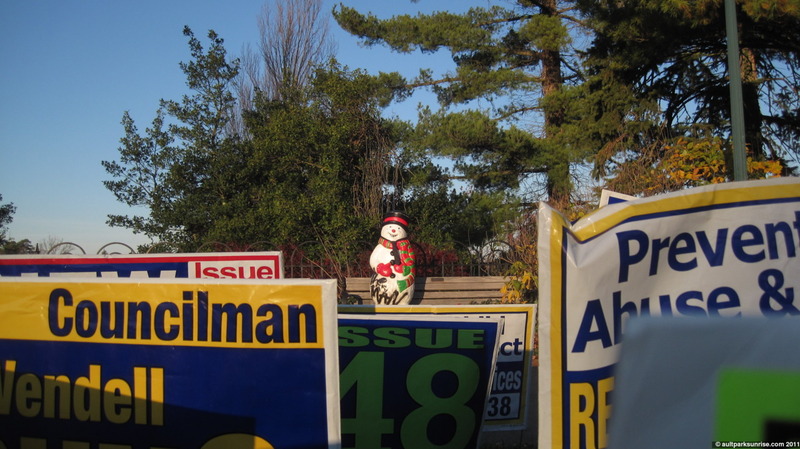 Looking out to the rally, the Snowman addresses his audience. An example of the “double V” double sheep. 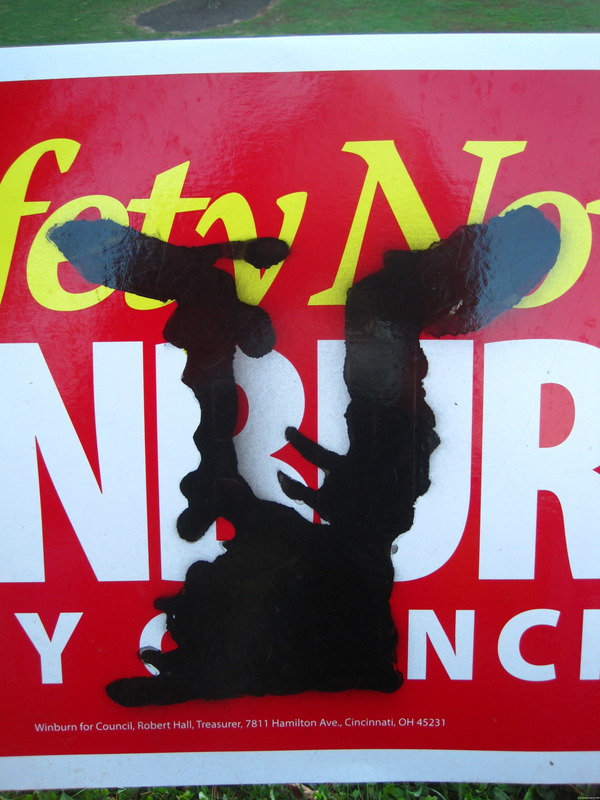 The best example of the head-on view of a sheep stencil. 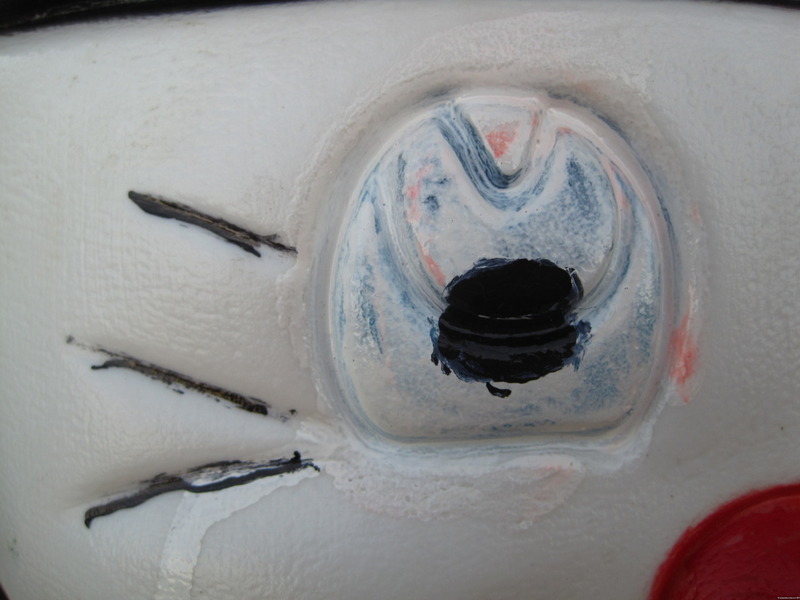 Detail of the eye work. White out across the face. Looking out at the snowman! 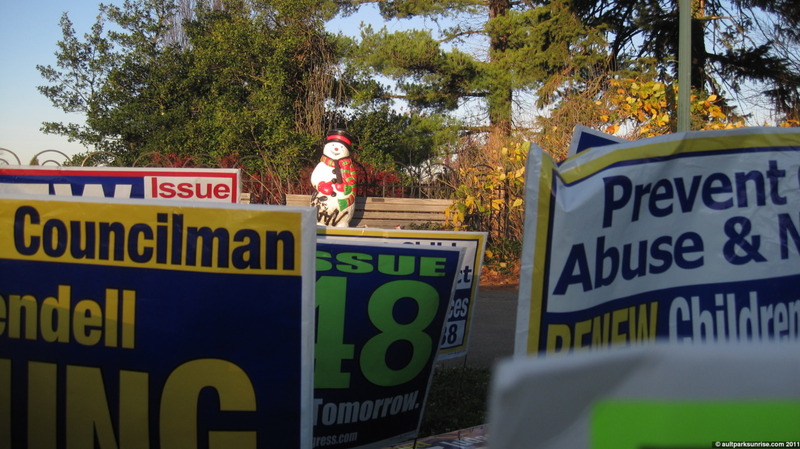 The rustling of the signs under the gusts of wind made me think all the signs were cheering together in support of Leader Snowman. Snowman under Blue Skies. I had to wait until the sun came up over the pavilion and lit up the snowman in early morning light. What would a post on Ault Park Sunrise be without a nice open shot of the sky? A final shot of the snowman, up close under the new morning light. 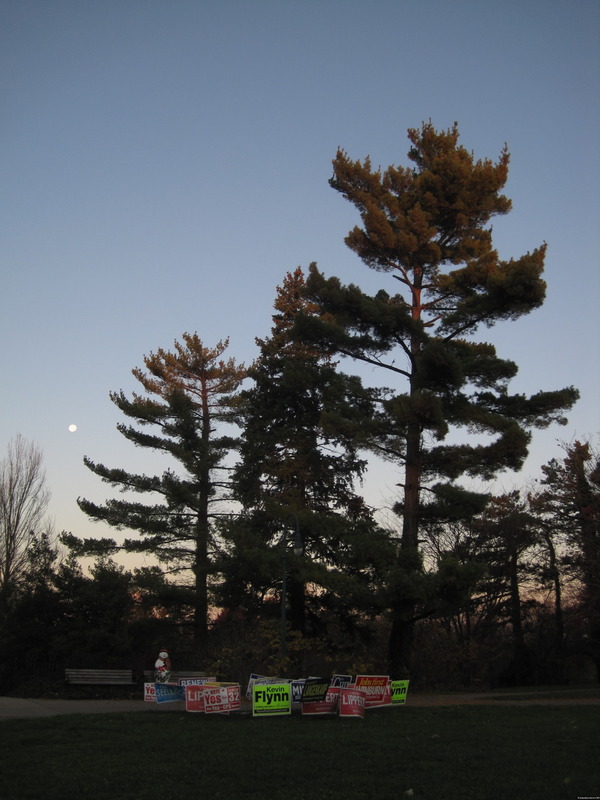 This entry was posted on November 13, 2011 by Ault Park Sunrise. 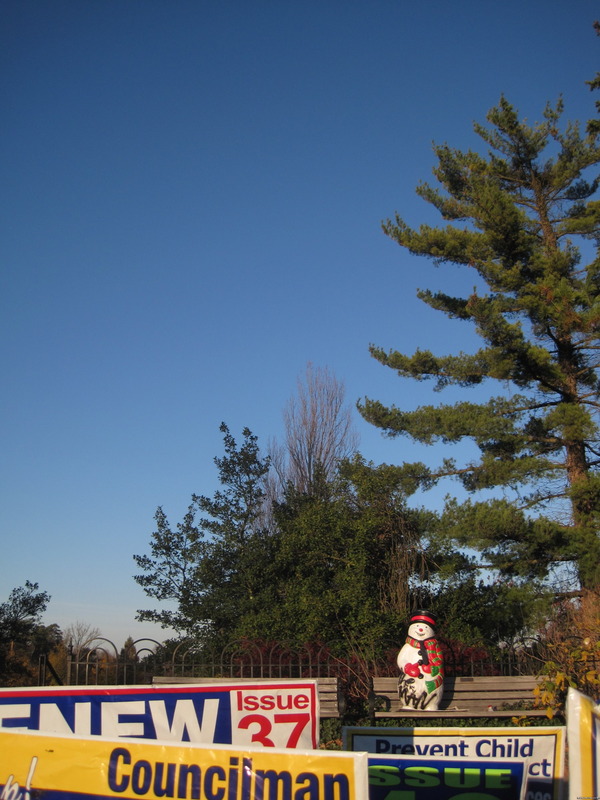 It was filed under ault park, clear skies and was tagged with art, ault park, cincinnati, snowman. I’m with you! I love installations like this! Three cheers for the person who put it all together. And another three cheers to you for documenting it! It looks like rabbit ears to me.